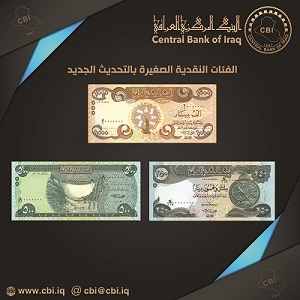 The Central Bank of Iraq issued its second edition of the banknotes of the categories of (25000, 10000, 1000, 500, 250) dinars, stressing that he will continue trading circulation of cash currently traded from the above categories with the new categories without any intention to withdraw from circulation. For the categories (25000, 10000, 500, 250) JD, it included the writing of the name of the governor instead of signing it in the old version, in line with what is now practiced in other countries. The dates Hijri and Gregorian dates were also amended to date (1440 H-2018 AD). As the category of (1000) dinars changed the face of the banknote, where the slogan "the inclusion of marshes and the effects of southern Iraq on the list of world heritage," instead of the image of the Islamic dinar in the old design, based on a decision in this regard in addition to writing the name of the governor also instead of signing In the old version and the modification of the Hijri and Gregorian dates to the two dates (1440 H -2018 AD). Iraq issues a new currency and posts pictures of them for everyone to see.